The messages show up atop your feed, and like Google Doodles, they may be themed around holidays or specific moments in history. However, Facebook seems to be placing a larger emphasis around current events as well, highlighting interesting things happening in local communities. In one example, Facebook suggests you check out the supermoon, along with a link explaining what’s so special about said moon. Another was a more traditional Thanksgiving greeting, the kind you might have already seen on your feed this past holiday. Speaking of holidays, you’ll now be able to share themed cards on the social network as well. 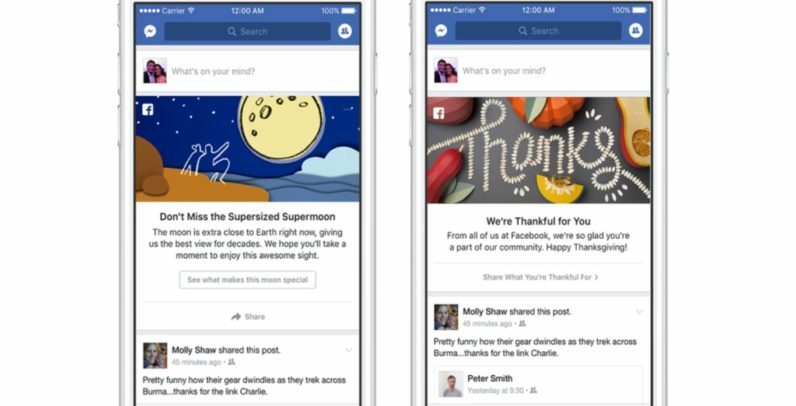 Facebook says users will start seeing invitations to share one of 18 holiday cards soon. For plenty of people, Facebook is the first app or website they check in the morning. It’s a small but nice touch to help Facebook feel a bit more alive, as well as build community conversations around specific events. That said, and while I’m personally on board, I’m also sure some people would like the ability to disable the messages as well. Update: Facebook points out that you can hide the posts from the arrow menu on the upper right corner, so there’s that.